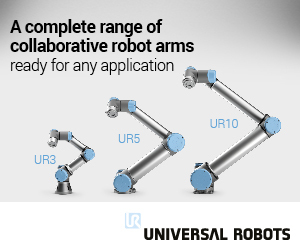 An articulated arm robot fixed in a static position can be tremendously helpful in performing production line tasks such as transferring, packing and sorting items from a conveyor, assembly or affixing components. 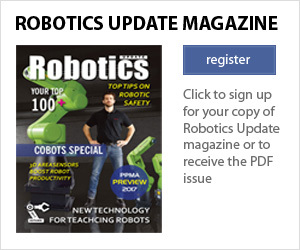 However flexible the robot is in terms of adapting to different routines and tasks, it hasn’t yet been able to travel round a shop floor to perform different tasks at individual workstations. 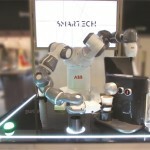 This is where Mitsubishi Electric and AGV manufacturer Mirage have done some lateral thinking and posed the question: why can’t we move the robot around, and if we did how many additional benefits would there be? Having now combined a Mirage AGV and a Mitsubishi Electric MELFA robotic arm as a stand-alone system, it’s clear that being able to deploy a robot at multiple workstations has a number of advantages. 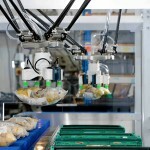 Not only can the robot move along a production line from product assembly to pick-and-place packaging tasks based on demand, it can switch lines and function to wherever it is needed. 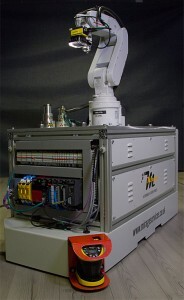 The AGV can move around the assembly line following a path traced by magnetic tape. 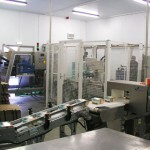 Radio frequency identification tags are used to tell the AGV where to stop, speed up or slow down. It is also equipped with safety scanners that allow the device to stop if an obstacle is found en route or an operator steps too close to the vehicle. 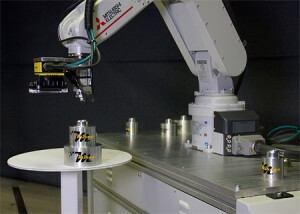 Robot and vehicle communicate via a Mitsubishi Electric PLC which enables them to determine when the AGV has reached the station and the task can be set in motion. 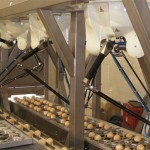 Having arrived at a designated workstation, before performing the actual task, the external vision system assesses the location of the machine to compensate for small variations in arrival position and recalculates its position relative to the station. 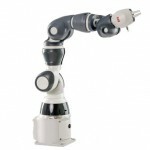 Once this datum point is established, all the accuracy of the industrial robot is retained. Equipped with on-board power supply that lasts up to 13 hours, the unit can easily complete a full shift before the power unit is quickly exchanged. Operators can interact with the robot and AGV via a Mitsubishi Electric graphic operator terminal (GOT) or remotely, using a Wi-Fi connected master control box. 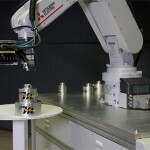 The robotic arm also features Mitsubishi Electric’s predictive maintenance tools, which enable operators to quickly determine any issues in the equipment and minimize downtime. 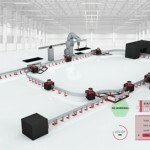 By maximising operator safety, ease of use, interconnectivity and flexibility on the factory floor the solution is an obvious enabler for achieving Industry 4.0 objectives.